is an updated and improved, efficient, portable woodshop that incorperates the main grouping of tools: the miter saw, router table and tablesaw outfeed into one easy to set up and store, portable workbench. The PTS2 measures 1824mm x864mm plus extensions on both sides measuring 1745mm each. 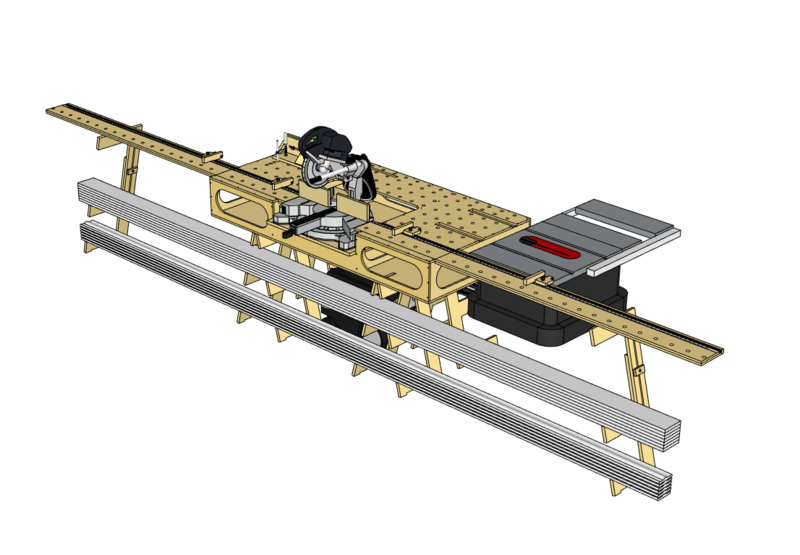 It is a miter stand, router table and table saw outfeed. The plans are extremely detailed and include plans for the workbench, main horses and extension supports, and router fence. The plans include a Shopping List with links, Materials layout, Parts Cut List, along with details and elevations. The plans are extremely detailed and are in METRIC measurements only for greater precision. You can purchase a standard metric tape measure, if you don't have one. we have provided a link to this in Ron's Amazon store. All plans are degitally delivered via a downloadable PDF only.